Yoshiki began by plugging his upcoming Madison Square Garden concert. A video recap of his past exploits played, exploring the dichotomy of his soul – a drum smashing rock iconoclast; a classically trained pianist who composed and played for the Emperor of Japan’s ascension anniversary. Who was the real Yoshiki? Neither? Both? Some impossible in-between? The video was frenzied, even messianic in its undertones, as he was quite literally borne aloft by his fans at prior concerts. After a brief chat about Hige’s death and the breakup of X-Japan, it was on to the songs. Yoshiki was very much turned out in classical style for this – a Shigeru Kanai piano, a flaring wool long coat, sunglasses, and his trademark leather pants combined with royal blue lighting to give him the look of a maestro. The three violinists and cellist who accompanied him (the “Yoshiki Sextet”) were good but not mirror-perfect; a minor mismatch in note timing at a transition in ‘Anniversary’ was noticeable but not fatal to the performance. Perhaps no one noticed more than Yoshiki himself, as the camera caught him grimacing and he apologized for nervousness immediately after the song concluded. As expected, soaring piano riffs dominated the packed hall. Yoshiki was very much a performer, content to play his role. He announced his protégé, Katie Fitzgerald, a former Otakon attendee. Together they debuted ‘HERO,’ the new Saint Seiya soundtrack song. For darkness and light, for its rich depths and the majesty of its soaring heights, nothing could match the piano work in ‘HERO.’ However, Katie’s performance, while technically proficient, failed to engage with its harrowing tale of cutting and suicide attempts. There was no daring in her vocal range, in her slow and steady progression through classic themes of unrequited love and abandonment. All of Yoshiki’s cunning and craft, though they were in full force, could not make up for the lack of authenticity with which she sang loss. The English version of ‘Tears’ was more emotional, but baffling in its differences with the well-known Japanese. Long-time fans will recall that Yoshiki suffered a difference of opinion with other members of X-Japan in that he wished to Anglicize the lyrics of X-Japan songs to appeal to the international audience. By the time he closed on ‘Endless Rain,’ however, nostalgia was in full force, with a good chunk of the audience softly echoing the chorus. The remaining members of X-Japan appeared on stage briefly during ‘Kurenai,’ but seemed to be there only to tease the audience, promising a full appearance during the upcoming Madison Square concert. As such, this was both more and less than an X-Japan reunion concert: Yoshiki was its clear focus. The genius of Yoshiki really lies in his exacting precision combined with a menace that speaks of hidden depths. The way he can over- or understrike notes, remaining within the acceptable range for the piano while hinting at more, is surely not something to be replicated by lesser performers. It may be that they lack the essential tension of conflicting forces that seems to always accompany him. We had the privilege of talking to prominent voice actress Saori Hayami, who is best known today for her role as Miyuki in Mahouka (The Irregular at Magic High School), as well as Ayase in Oreimo, Sawa in Tari Tari, and many other leading roles. You decided to become a voice actress in elementary school. Why did you decide to pursue that so early in your life? Well, looking back—I really did start very early! But I think that was the time when I had the most energy about my dream. I didn’t think so much about the process of getting used to it, but I was thinking more like “Oh, there is this kind of job. Wow, it must be fun!” So I decided very quickly to pursue it that way. You play piano and draw well, we heard. Have you ever won any awards for them? (Laughs.) I never actually entered a contest, but I did have piano recitals. As for drawing, as you might have guessed from my laughter….I’m really not that good at it. But when I was in elementary school, I had private drawing lessons and the drawings from those lessons were shown at the Ueno art museum. I mentioned that once on a radio show, and for some reason that was picked up and included as part of my profile. But my drawings are totally opposite from the ones you might imagine. See, the picture I drew was like this boxy square building on this size of paper with eight windows on it. It wasn’t very good, and I was rather bad at it, but it entered the museum. I’m still wondering, what was all that about? You like “Aibou,” a detective drama. Why do you enjoy police dramas like that? I’ve liked detective dramas since I was a kid. In Japan there are a lot of two hour dramas, and I was watching them from my early childhood. [In fact] I watched them more than anime. So, I feel really close to them, and that has culminated in Aibou somehow. So every once in a while, during the noontime program, I saw a rerun of Aibou and thought, “oh, this is interesting.” And that happened many times, and so I finally started watching the show. I could go on and on about it…so what appealed to me about Aibou? Maybe the kizuna (special bond) the characters shared. And the side characters around them are deep too, and that’s what I liked it about. In Mahouka, you play a sister who has strong emotional feelings toward her older brother. They almost act like lovers. What’s your opinion on brother/sister relationships in anime? I don’t have brothers or sisters—I’m an only child—so I don’t know what it’s like to have siblings at all, let alone falling in love with them! I can imagine if I had a brother, but to fall in love with him, I couldn’t ever see that in my life. Still, my close friends who have siblings don’t think they can have romance with their them, so perhaps if I ever had a brother, I don’t think I would have romance with a him either. Yoshiki, joined by fellow X Japan band members Pata (guitar) and Heath (bass), gave a press conference at Otakon 2014. This is the transcription of that event, edited for clarity. (Yoshiki spoke in English throughout so it is not filtered by translation.) Our photographer Shizuka was on hand to take pictures and to ask a question as well. X Japan will be performing at New York’s Madison Square Garden (MSG) on October 11, coinciding with New York Comic Con. Will another world tour be able to follow [the MSG show] within the next year or sometime in the foreseeable future? Are these shows to promote your album, or are these just great opportunities for X Japan? Yoshiki: Well, we haven’t released an album in a long time, though we released a compilation CD just a few months ago. About 22 years ago, we had a press conference in New York at Rockefeller Center when we signed with Atlantic Records. That was supposed to be a big deal, we were then supposed to release an album, but a lot of things happened. So, 22 years later, we come back to New York and are playing a show. I can’t really tell you why we’re doing this MSG show, but you are going to know soon. There is something going on. Yes. Yoshiki, you’ve been involved with charity projects, such as the Red Cross for tsunami relief. Can you tell us a little about what you’ve taken away from those experiences and whether you have any projects like that planned for the future? When I was 10 years old, I lost my father to suicide. So I had a pretty depressed childhood. So I kind of understand the pain children have, so several years ago I decided to create my own charitable foundation. I try to support children who have that kind of pain….Unfortunately right after I established my foundation, there was the big earthquake that happened in Japan. At that moment I concentrated and focused on that, to support victims of the earthquake and tsunami. When you save people, I also feel saved for some reason. It’s like I want to keep doing this for the rest of my life, just at my own pace. Yoshiki, you’ve been touring Yoshiki Classical…I was wondering how preparing for that differs from preparing for X Japan. Yoshiki: X Japan is pretty much my life. Everything else is like a side project. Even on my classical tour, when I went to many countries and places, I said, “X Japan is my life.” It’s not like we’ve been doing different projects and coming back to this…it’s not like we just got back together and played…. [X Japan] just runs in my blood. X Japan is more than a project. It’s our lives. 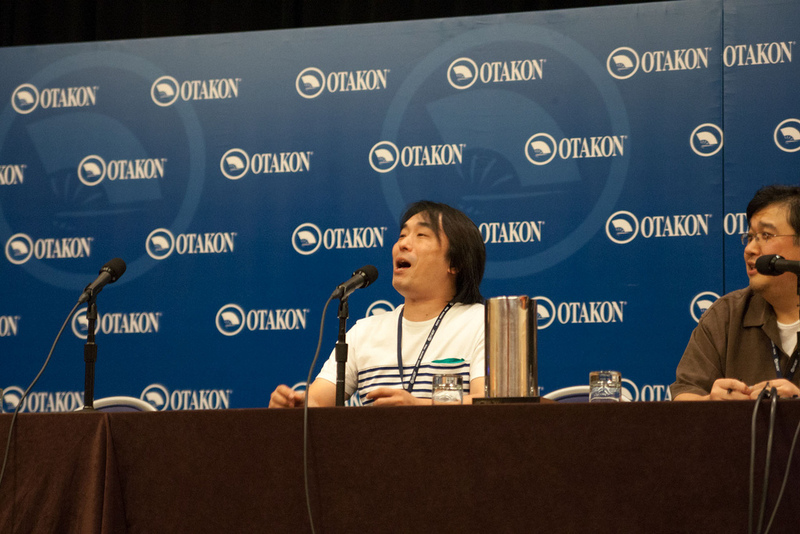 How did you first find out about Otakon, and what made you come back again? Also, what are your thoughts about Baltimore as a city? Yoshiki: because you guys are so cool! (Laughter) Yes, I cam here for the first time in, what, 2008? 2007? 2006. Wow, that’s like 8 years ago! So that means Otakon was my first convention experience. At that time, I wasn’t even doing X Japan and I wasn’t even talking to Toshi. Since then a lot of things have happened. We didn’t know we had that many fans in America, or even outside of Japan, so we started finding out that whoa, people throughout the world have started listening to our music. It was so cool surrounded by these people. This is our third time in America though, in 2010 we played at Lollapalooza. So 2006, 2010, 2014…I’m going to be here in 2018 then. (Laughter) Every four years, like the Olympics. All your friends call you a “vampire” and that you should play Lestat in a movie. When are you going to do a vampire-themed rock opera? Huh, good idea. I think I have a split personality about some things. Sometimes I’m called a vampire, sometimes I’m Yoshiki, sometimes I’m a character called Blood Red Dragon, created by Stan Lee…. Wherever I am, struggling during the Yoshiki Classical World Tour over 10 countries, I always stayed up nights. It’s something vampirish…I’m only half joking, half serious. Sometimes I say I’m half Japanese, half vampire, something like that. I just love the image of the vampire, you know. So yeah…it’s a good idea to create a vampire rock opera. That’d be cool. (Our question.) You’re not just a musical icon but also a fashion leader. How do music and fashion relate for you? Before my father died, he used to own a kimono shop, a Japanese traditional clothing shop. I grew up in that kind of environment, so I was always surrounded by kimonos. When we started X Japan, we put on a lot of interesting clothes and makeup, and dyed our hair red and purple. So fashion and music are inseparable, at least to us. Fashion is music, music is fashion, so it’s very natural to have both. Everything came very naturally. Now I have a YoshiKimono clothing line. Actually, I’m going to be debuting the YoshiKimono Tokyo Collection 2015. You’ve been involved in a lot of different collaborations–credit cards, wines, just to name a few. What other products would like you to release in the future? (To Heath) We saw a video once in the past. It was Phantom of the Opera styled, you were in a cage coming down, you had people doing robot dances around you, and there was an incredible bass solo…will you ever do something similar to that again, especially in a venue like MSG? Heath: I think that rock needs something very shocking, both visually and musically…that is rock, that is X Japan. MSG has shock to it that is not like something before, so I’d like to do a new kind of shock there. In the near future, please look forward to it. Have any of you have had memorable experiences interacting with your fans? Some of the songs on Yoshiki Classical were previously released and performed with vocals. (For example, “Amethyst” was originally written for Violet UK.) How are you able to convey the messages of the original vocal version of the songs in the instrumental version? “Amethyst” was classical from the get go, so I didn’t write lyrics first…I wrote the lyrics later. What happened was, we had an incident at a Tokyo amusement park–an X Japan event. At that particular attraction, my classical music was playing. One of the old members, Hide, said, “What is this song? This is one of my old compositions. We should use this at the Tokyo Dome for X Japan’s opening.” Like, really? I didn’t even think about that. Then, that was the the beginning of using “Amethyst” at the Tokyo Dome X Japan show. As long as there is a great melody, we can put some nice lyrics on top of it. X Japan songs can be instrumentals, with or without lyrics. I think about melody first. We had the privilege of interviewing longtime animator, character designer, and animation director Hidenori Matsubara. A longtime colleague of Hideaki Anno, he’s worked on most major Gainax projects as well as the recent Evangelion Rebuild movies. His work goes back to the late 1980s and includes titles like Oh My Goddess, Steamboy, and the upcoming film At the Corner of the World. This transcript is based on the on-site translation, and has been edited for clarity. Computers have changed the animation process a lot. What are some of the benefits of using digital and what was it like using a computer to do animation for the first time? [With digital processing,] I guess there is less deterioation in the final processing. Before, when art was transferred to a cel, there would be some decay. That’s the best part [of using digital]: there is no more shifting of the art when it’s transferred to celluloid. There’s no more dust, no more scratching. Before, there used to be this gigantic camera that takes a picture of the cel, but with computers there’s a lot more freedom of expression. As for modern techniques, it’s more like I didn’t have a choice, so I just went along with it. One day in 2000-2001, when doing illustrations for magazines, I was given the company’s final celluloid. That was it for cels; there was just no choice. Has the use of digital processing changed his own day to day work greatly? It hasn’t really changed. For me, it’s still pencil and paper. Some people work on tablets and with the computer, but I haven’t. I never tried it, so I don’t even know if it it’s easier or not. Do you think one man animation projects like Makoto Shinkai’s Voices of a Distant Star are where things are headed in animation? Or is this a temporary thing? That type of person and production exists, but there’s a variety of productions out there too. [After all], Shinkai works on regular anime now. Everyone’s different; like, Shinkai is really into doing backgrounds himself, whereas [Hideaki] Anno likes doing the layouts himself. Each director has a way of doing things. It’s not like a self-animation would be the only thing out there. Speaking of Anno, you’ve worked with him for a long time. How has Anno changed or stayed the same over the years? Nothing’s really changed. He’s like a big shot now, but basically nothing’s changed. What was it like working for Gainax in its early days? I started [at Gainax] on Wings of Honneamise; I was a total newbie back then. Then I was an in-betweener, and promoted to key animator for Gunbuster—which was Anno’s first directorial work. After that there was Nadia: Secret of Blue Water, where I became an animation director for the first time. And after that was Otaku no Video. Since Nadia was a TV series, I was one of many animation directors. But for Otaku no Video, there was only 2 animation directors, so I was happy to be chosen for that one. As for the Evangelion TV series, I was busy with a lot of other things, so I only contributed to a part of it, but I did have a lot of fun. So just how accurate was Otaku no Video as a depiction of Gainax then? It’s not wrong! Maybe it softened up our image a little. [Gainax] basically started as people in their early 20s in a nameless company making a movie, and all those people are basically big shots now, so that’s impressive. You mentioned in an earlier interview about how courageous Wings of Honneamise was and how perhaps a project like that wouldn’t have been greenlit now. Do you think courage plays a large role in the creation of anime? It’s really up to the individual, to personal feeling. Maybe I did have courage back then, but when you’re young, you just don’t think about things like that. Six hours ago, ALTIMA made a daring promise. The Japanese pop trio, responding to a question of whether they would ever cover a Run DMC song, boldly urged members of the press and public to attend their evening Otakon concert. One hour ago, they delivered. Full of power, grace, and confidence, ALTIMA put on a dynamic performance – flitting about the stage, posing with each other, and swapping keyboards for guitars. They stopped at nothing to please the audience – dancing, strutting, jumping, and thrilling Baltimore with rousing renditions of Run DMC’s ‘Walk This Way’ and Joan Jett’s ‘I Love Rock n Roll.’ The audience responded with adulation – jumping out of their seats, waving colored glow sticks, and even running in place as Motsu trotted out Japanese dances for them to attempt. Everything was on the mark: the sound technicians, the lighting, the beat, and the cavorting performers. There was one time when a sound tech did not make an instantaneous adjustment, but it meant nothing next to the sheer energy and raw enthusiasm displayed by Motsu and Maon, set against the backdrop of digital pop provided by Sat. There are times in live performances where the human element falters, rendering the result less than a recording, and there are times when humanity rises to all challenges and creates a work of true beauty and matchless wonder. At the end of the concert, Maon cried out that she would remember it for the rest of her life. This was no exaggeration. Motsu, you put the band together. Could you tell us why you felt compelled to work with these artists? Motsu – At first . . . ? I love J-pop – and my old band, m.o.v.e., starting doing less digital J-pop. I found on YouTube that I could do digital J-pop with Sat, and we just needed a vocalist who was into it. We found her, and we were set! Any funny or inspiring stories from the road? Maon – In Thailand and in HK, the crowd had memorized the songs and sang with us! I felt that music connects us, even across distance, borders, and cultures. Motsu – I love how loud the fans get in the US! It’s the best feeling, being cheered on like that. Sat – We visited many places for the music videos and had a lot of experiences. It’s a real honor to be in the US. You are each from different musical traditions. What is the concept of ALTIMA? Sat – What we aim at is digital J-pop. I don’t know if you’d say digital pop exists elsewhere in the world, but digital J-pop is exactly what we want to do. Motsu – (Laughs.) (Pauses.) For me, as a rapper . . . Beastie Boys, 2Unlimited, house music . . . Sat – Run DMC, Walk this Way! Maon – For me, actually, a lot of anime artists! Minami Kuribayashi, Mizuki Nana, JAM Project – I found this style of music most interesting and I want to tell the world how wonderful it is! Sat – I also manage FripSide . . . we were successful and I had the chance to work with Omura Tetsuya. I said, “I did it!” It really felt like a milestone in my life. Maon – I also really respect Hamasaki Ayumi. How do you deal with creative differences? Sat – Seriously, though, we’re all in different age groups – 20s, 30s, 40s. We don’t really argue and we have no problem talking things over. What are the greatest challenges you’ve faced in your music careers? Motsu – Starting up this group, actually. Three years ago, not everyone was sold on this idea. We faced a lot of opposition. It was worth it though – we’re here now! Sat – I likewise feel the greatest challenge was putting this group together. But I was a huge fan of Motsu already, so I knew I wanted to work with him! Motsu – (Embarrassed) Oh, thank you. Thank you. Maon – My own greatest challenge? Actually, it was stepping up and singing! I am really the introverted type; I love being inside playing dating simulation games, but when I discovered the world of anime music, I became passionate about sharing it with everyone. So stepping into the light was my biggest challenge. You mentioned that Run DMC influenced you. Is there any chance we’ll see a Run DMC cover some time? Motsu – Yes. Come to our concert tonight! What’s your favorite swear word? Maon – English or Japanese? Bonus question: Where’d you get your shades? They’re very distinctive. Motsu – It’s my own brand! Ghetto Blaster. So we could say I made them myself. You move so fluidly! Did you have dance training, Motsu? Motsu – I started out as a dancer. Do you have a message for your US fans? Motsu – You guys give us huge greetings when we come to the US. It’s great to have you cheering us on! Sat – As the producer, let me say – we try for an unconventional style. I really want to see how fans react to it! Maon – Even in Japan, it’s a rare opportunity to do everything raw. Here in the US, it’s an especially rare opportunity to bring you our raw sound, our raw voices . . . I’m looking forward to it! Sat – I really hope we can spread exposure across the country to those who are looking for our sound. So I hope you guys can write good articles and convey our spirit to the world! 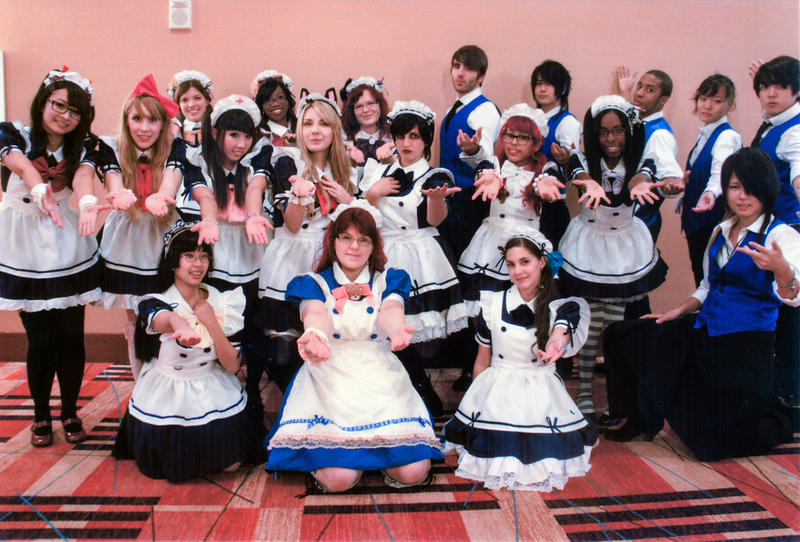 Maid Cafe returns for its sophomore year at Otakon. In hindsight, my lack of excitement beforehand foreshadows my conclusions. I feel bad because in some respects, it isn’t exactly fair to make comparisons. After all, Zagat rates restaurants on individual merit and this should be no different. That said, my lukewarm feelings toward Otakon’s Maid Cafe stems from an inherent expectation that I felt went unmet. The main selling point of a maid cafe lies in creating an illusion of a Master/maid relationship. Otakon fails to deliver this essential on multiple fronts. For one, patrons do not have the pleasure of choosing his/her maid. For another, they are seated together with strangers with eight to a table. The magical illusion cannot materialize without the possibility of an intimate rapport between patron and maid. It also creates a possible, albeit tiny, conflict when choosing a game to play. 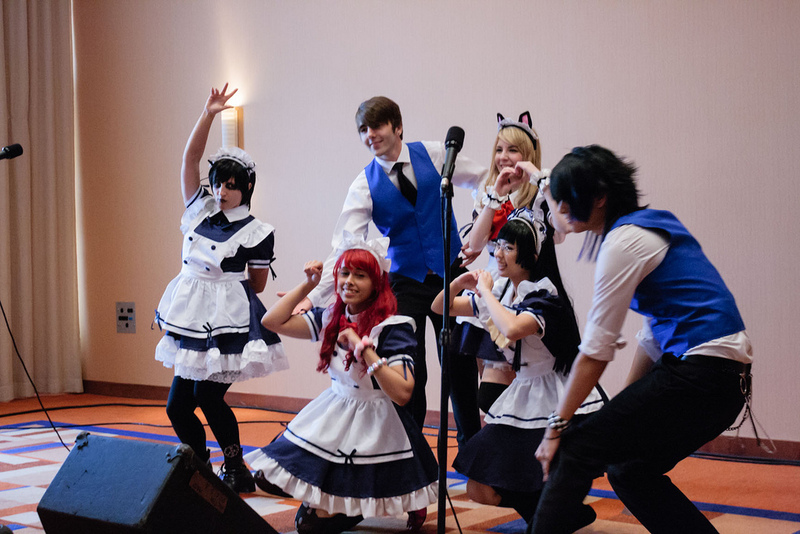 In short, Otakon’s Maid Cafe is merely a glorified café where wait staff cosplay as maid or butler. Speaking of which, the service left more to be desired. I didn’t time the duration but for someone who didn’t even order anything, it felt long from the time of order to receipt of one’s drink. The Maid Cafe suffers from a limited menu. While located in the Hilton, the space is not adjacent to a kitchen. This meant food choices were only of the dessert variety which is clearly publicized beforehand. It’s just that I am sure there are others like me who enjoy having a full meal at a maid cafe and are disappointed that cannot be part of their Otakon experience. A larger venue could help bring the experience to more Otakon members. The ability to sit more people per session should translate into shorter lines (assuming demand remains flat). 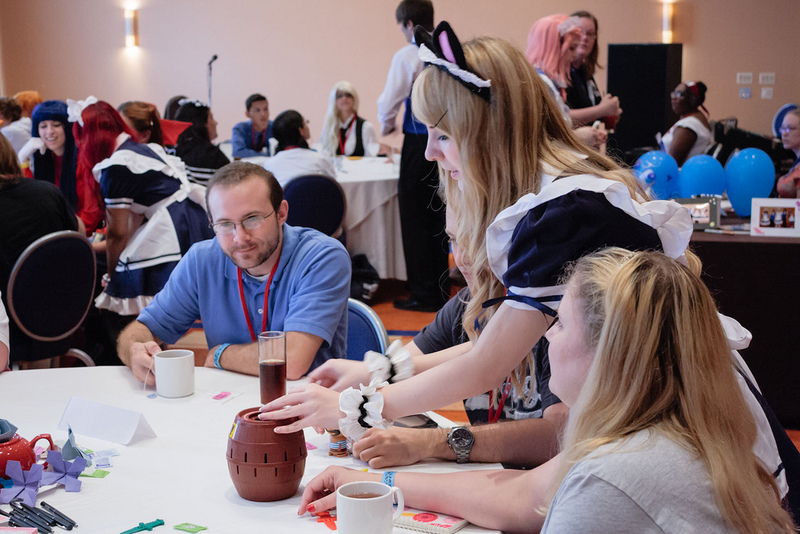 Because despite all of its faults, there is plenty to love about Otakon’s Maid Cafe. Hours of operations is an immense improvement from last year. Not only are there more sessions per day, the Maid Cafe is open on Sunday as well. This, to my knowledge, puts Otakon as the sole convention to achieve this feat that I am confident others will likely emulate. Shizuka and I didn’t know what to expect when we opted for the surprise session. Turns out it was a birthday song to celebrate Crabby-chan’s 20th complete with cake and candle. Otherwise, patrons are treated to one delightful performance of song and dance. Including a raffle ticket with the price of admission sets a festitive mood. Prizes range from the appropriately maid headpiece to decorative ornaments. While holding little intrinsic value, they certainly provide a priceless keepsake for three lucky patrons. Those not as fortuitous will still leave with a framed photo of the lovely maids/butlers that is given to everyone. Patrons will treasure this special souvenir because each maid and butler take turns among all the tables to personally autograph the frame. Those specifically hoping to magically transform into a Master/Mistress with a maid or butler will find Otakon’s Maid Cafe disappointing. For everyone else, it is a sweet time of fun and games sure to rot your teeth away! See more pictures here. Anime Diet was privileged to interview singer/songwriter Chiaki Ishikawa at Otakon 2013. Perhaps best known for the OP of Bokurano, “Uninstall,” which she also performed in concert at the convention, Ishikawa has written many anime songs in the course of her career: first with the band See Saw (where Yuki Kajiura was her partner), and later solo. Her most recent work is with the mecha anime Majestic Prince. The Paper conducted the interview, with Shizuka taking a few pictures. Questions were written by gendomike and The Paper. Translation by Rome. People ask me that a lot. I don’t have anyone in particular–for a US musician, maybe Eddie Vedder, but right now I listen to a lot of samples of new artists that sing anime songs. How would you compare Anime Expo 2007 vs this year’s Otakon? Well, Los Angeles had a lot of cosplayers and the hotels were a mess. * Otakon is more otaku oriented. How was working with young Yuki Kajiura? Did you think she would be as big as she became? The first time we met? Did I think back then that Kajiura would be this huge? Well, we got successful by doing anime songs. By the standards of the mainstream J-pop industry, we weren’t good at all. The current singers who are around Kajirua practice singing with her because Kajiura is so big, but I’d thought Kajiura was great since I started singing with her. I mean, I simply loved her songs. It’s not surprising to me at all that she’s become so famous. I thought she would from the start. Do you plan to work with Kajiura again? Well, we don’t have the opportunity. We never have time to get together and do songs. Was your musical approach influenced by Kajiura apart from See Saw? Well, I’d say we both influenced each other. She composed songs based on things I sang too. We were working really hard when we were together. How do you write lyrics without music for anime? I think it’s based on the flow of the anime. First you have the anime itself: you have the director’s opinion, and a good-enough scenario…so then I get the synopsis. And I write song based on the synopsis. And while there are people who write music first and then the lyrics, I write lyrics first and then the music. But since I don’t know how the ending is going to be, I imagine the plot myself and then write lyrics. By keeping a certain good artistic distance from the production, I can create a good song. Your songs tend to sound melancholy, often written in minor keys. Why? *This was in reference to reports that at Anime Expo 2007, guest of honor hotel rooms were sometimes not prepared when the guests arrived from Japan. Haruko Momoi in particular complained publicly about it and other problems, spawning controversy. If it wasn’t for Yoko, the winner of the Otakon concert would have been one of the bands at the matsuri. Except the ultimate winner was really the… rain! Indeed, a good chunk of the matsuri got rained out. The Slants never got to play, their flyer feeling forever forlorn in my pocket. Nevertheless, I enjoyed it and thought it was much improved from last year. 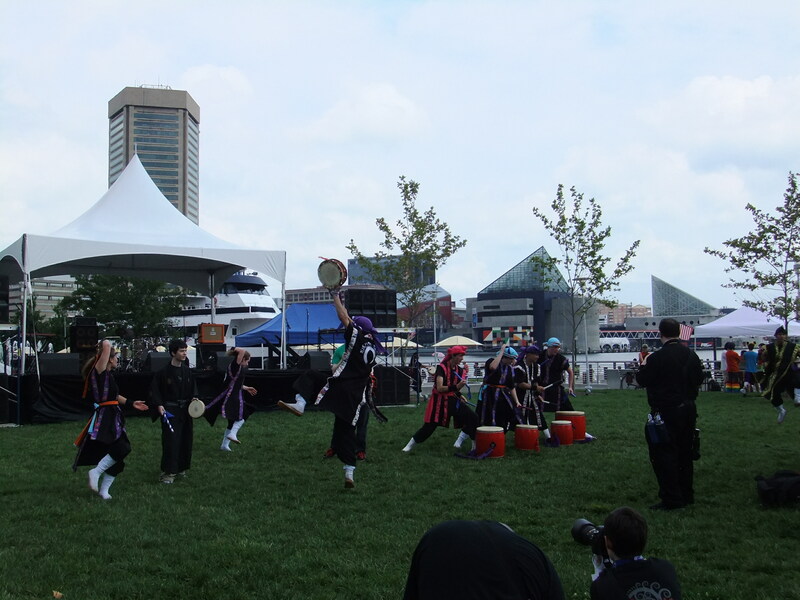 The new location, less than fifteen minutes walking from the BCC, greatly enhanced the matsuri. The West Shore Park is literally a stone’s throw from the water providing a magnificent backdrop to the festivities. It also attracted significant passing attention from office workers to students on school trips, the latter of which felt robbed that the Aquarium/Science Center/Whatever didn’t measure up judging by some of their expressions as the teachers themselves hesitantly ushered the kids along. Booths formed a horseshoe on the grass facing the stage. 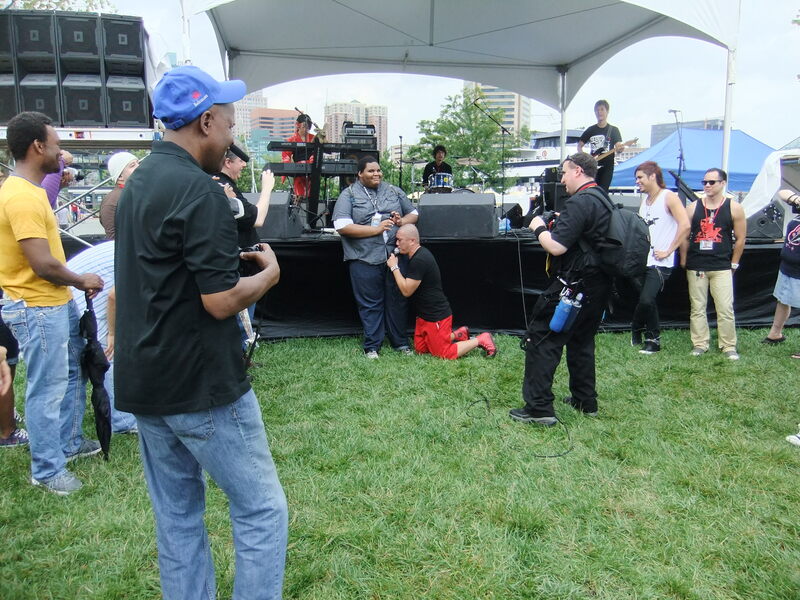 Besides tents of the performers, nearby area organizations such as the DC Anime Club and Anime USA made appearances. The Otakon tent had refreshments at very reasonable prices with two bottles of ice cold water for only one dollar. I was surprised and disappointed that there were no food vendors present until I visited Press Ops during one of the rain delays where I learned that the three food trucks parked on the street were actually hired, not entrepreneurs seizing the opportunity. More food options are only a five minute walk away at the mall. Finally, I counted three booths where kids could amuse themselves with the typical fairground games. The Chin Hamaya Culture Center and DJ Cutman returned from last year. Both performances were solid but I have nothing to add a year later. The taiko drumming sensation did perform a rendition of “Who Let the Dogs Out” which amused me. Adam WarRock opened his set with a song about Pacific Rim. His rapping is impeccably average against solid booming beats. A woman behind me remarked his good taste for the lack of profanity but I demand much more in my hip hop. While he proclaimed that “it’s really tiresome to rap under the sun”, his energy did not show it. Indeed, it was his personality that endeared us. For someone rooted to the same spot for practically the entire time, his movements carried us in the moment. I found myself nodding along as his arm and head slashed and snapped about. Even as rain started to fall, some remained getting soaked in place to watch him. Entirely revolved around pop culture and all things nerdy, he proudly professed his nerdom and encouraged all of us to do the same. It was a simple message that he delivered wholeheartedly. There was supposed to be a yukata contest and I think it did occur except I had expected it to do so on stage not on the grass infront. I saw maybe ten women beautifully attired with some holding lovely paper umbrellas gathered around for photographs. I would have taken photos but opted to hide from the drizzle under the tent. My decision proved wise as rain poured shortly after. The matsuri washed away instantly as staff placed covers over equipment. However, before long, the next band would easily cajole us out under the tents for an epic performance. I was delighted to run into Manga Therapy and Bobbie-chan during soundcheck. He prefaced the band for me, having seen them before in New York which sounded very promising. We got so much more. There are bands who are really good live. Then there’s Uzuhi. You can watch the video to see what I mean. At one point, he started speaking to us before slowly degenerating into Engrish. Asking us if we understood him, he accused us of being too otaku when we replied in the affirmative. What I didn’t capture in motion picture speaks even louder. He jumped off the stage into the crowd but what happened next was utterly and unpredictably awesome. Pointing and grabbing people, he commanded them to dance together. Boy girl boy girl then boy boy. The two guys did not look thrilled yet voiced no protest then shaked out a move or two that ilicited smiles and laughter all around. Smile. Happiness. Those are Uzuhi’s mission. And they do not dissapoint. The pictures tell all. Unfortunately, I was supposed to pick up Linda and company from the bus stop and they just had to arrive during the best set of the matsuri. I originally asked her if she could wait then felt bad at my selfishness so after roughly half past five, I departed the matsuri with a heavy heart, not knowing that I wouldn’t get the chance to return, the music of chocolate smile fading behind me. I was supposed to attend Kit’s panel on Utena and Madoka after my Chiaki interview but Mori was too punk for Otakon so I made my way over to Seki’s panel. I am glad I did. I knew nothing about the prolific voice actor beforehand and still know very little. I just have an iota of interest in seiyus. Seki is different. He is super cute and even more hilarious. Really, really hilarious. Good humor is incredibly difficult to execute. It requires an extremely sharp wit and even better timing. Seki commands both like a skilled Gundam pilot. I originally took notes but his contagious personality quickly overwhelmed me. It was far better to live in the moment. So readers please forgive me for I have only two questions below. Suffice to say, one had to be there to fully appreciate it. I don’t even recall the question, not that it matters. His humor goes beyond context and easily relates to anyone. The man’s generosity rivals his humor. Practically every fan ended a question with a request for him to repeat a line from their favorite show. He performed each one as if he was recording in the studio. The crowd cheered in thunderous unison each time. It got to the point where I started to feel that the audience was beyond polite. Yet he never showed signs of annoyance. He even took a minute to study several lines prewritten by a fan before singing it. I am listing Seki down as someone I would love to interview. More pictures here. Vertical, the one Industry panel I was able to attend this year. As people who follow me on twitter, can see.. I did make an attempt to live tweet the panel. Ed Chavez, marketing director from Vertical Inc that day, cosplayed as a general from the Gundam series. The following are notes that are either from presentation slides or my Twitter, many of this is similar to what Ed presented at AnimeNEXT. Chavez stressed the survival of Vertical is dependent on pre-orders made, before seeing Vertical books published. Knights of Sidonia: Vol 4 on sale August, 2013. Mobile Suit Gundam: The Origins Part 3 on sale September, 2013. This is a prized project of Vertical, there’s going to be an anime next year. Flowers of Evil: Vol 7 on sale October, 2013. There’s a completely new style of cover, and that got revealed. Chi’s Sweet Home: Vol 10 on sale August, 2013. Ed reiterated that Chi is a very big seller for Vertical. Konami Kanata, mangaka who was a guest at Toronto Comics Arts Festival in 2012 was quite impressed by fans and decided to extend the series to being concluded in 13 volumes instead of 10 volumes as planned. Insufficient Direction on sale February, 2014. This is Moyoco Anno’s manga on living life with her famous husband, Hideaki Anno who was responsible for directing Evangelion. Moyoco Anno previously published Sakuran in English with Vertical. What Did You Eat Yesterday? By Fumi Yoshinaga, this title was announced at Otakon, and targeted to be released around March, 2014. This is a 10 volume series that speaks about being homosexual and living in modern Tokyo with foodie experiences being mention. So after all the Vertical announcements were over and with time remaining. Ed jumped right into educating audience of this panel to the professional side of what it takes as a publisher to license and release manga in America. There are several steps that includes Research & Development, Budgeting, Bidding, Contracting, Production, and Scheduling. Research & Development involves a lot of reading. Ed mentions how lucky it is for non Japanese fans to get the best of the best when there is a lot of mediocrity in the manga market. He stresses that Vertical is very accessible to fans over on Tumblr. But he does mention that Vertical would listen to media companies more. Many of their titles like Flowers of Evil, From the New World and Gundam the Origins has anime adaptations and reaches a wider audience, so if there was other interests in it, then they would listen to the bigger group. Budgeting involves seeing how much money would the publisher have. This also ties into Bidding and Contracting. Scheduling is the agreed upon time, so a publisher must print in a proposed time or they lose out. This happens to many American companies who are no longer in the manga business. The concept for Out of Stock is different from Out of Print. Japanese companies operate on a different scale than American companies. They require all money up front, before American publishers localizes any title. Also apparently there is the current standard for publishing and pricing digital books. It is definitely more cheaper for consumers to purchase digital, but behind the scenes it takes three times the price for publishers to produce such digital copies. It does sound like a strange concept, but it can be said that publishers such as Vertical is selling print book to afford emanga. Victor Albisharat (Head of Otakon Press and Publicity) was able to release an official statement and set list regarding about Yoko Kanno around 9am EST on August 15. This is the official Set list for what Kanno played during her concert on Sunday.